The biggest fear first-time campers often have aren’t bears or bugs, but rather their sleeping bags – having to face one when the sun sets makes it abundantly clear you’re far away from home. Your comfortable bed and the heating in your residence are replaced with a single lengthy sack that acts as your main shelter from the elements even when inside a tent. Sleeping bags should be light to carry yet exceedingly comfortable and protective, which is why many of them simply can’t get the job done. Here are 3 that can, though, ranked by overall value. Do you get cold even when you shouldn’t be? Rab Expedition 1400 will keep you warm like very few other bags can. This bag is meant to keep mountaineers warm at extreme altitudes(sometimes exceeding over 8,000 meters), so it’s safe to say that you might be sweating a little if your camping evening takes a warmer turn. Indeed, while amazingly effective at providing warmth, the bag will have very limited usefulness for camping trips to hotter locations – you’ll have to keep it partially open, which could invite a host if unwanted insect and arachnid visitors. Another factor making this bag ‘only good’ is its price – the unparalleled insulation has a cost of slightly over $1,000 dollars, so you better know you’re into camping before considering it. Eddie Bauer goes hand-in-hand with daring camping adventures, so any piece of equipment carrying his name should do the trick. 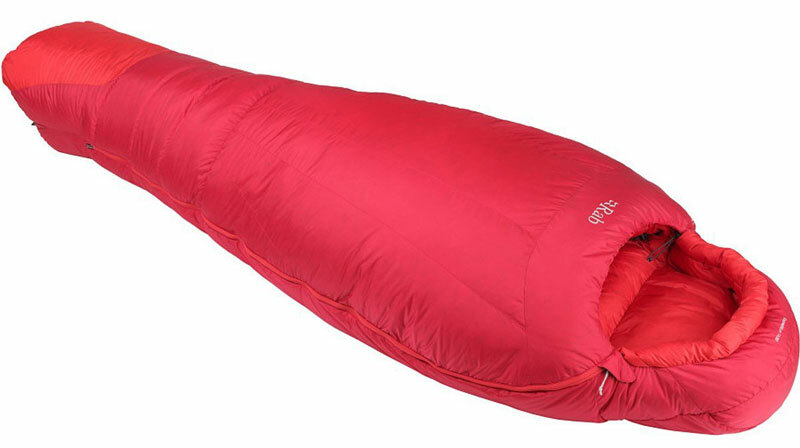 For the most part, the Airbender 20 does just that – it’s like a technological marvel among sleeping bags, featuring an air pad you can inflate and deflate as you see fit as well as two different insulation methods for various weather conditions. The bag is fairly small when compressed and is also lightweight, meaning it won’t weigh you down even if you’re climbing rocks or mountains. Another good reason to get the Airbender 20 is that it’s about as stylish as sleeping bags get: the all-black body with bright green letters and zipper might make you seem as if you’re a Navy SEAL instead of a happy camper whenever you’re in it. Unfortunately, the bag’s perks come with an $800 price tag, putting it outside the range of anyone for whom camping isn’t a regular thing. This is one bag Captain Nemo wouldn’t mind sleeping in – the Nemo Sonic’s main selling point is that it’s a bag with gills. Aside from giving it a funky appearance during warmer expeditions, the gills serve to filter out heat based on the camper’s wishes – the ventilation system works so well that it filters excessive heat from the bag without allowing cold gusts of wind from reaching you in your time of rest. Aside from being suitable for every season, the bag is also very comfortable and decent-looking from the outside. Considering its heat-adjusting options, the price of $500 is more than justified as you won’t have to carry any additional bags with you. There’s no doubt that urbanization and industrialization are taking their tolls on the planet. But it’s only when we truly stop caring about nature and its gifts that we should truly start worrying. A single look at the beauty of some of our national parks proves that there might not be cause for alarm just yet, as natural oases can exist even in a rich industrial nation like ours. Texas, in particular, is home to some of the best-looking nature parks on the planet – here are 4 Texas State Parks that also double-up as great camping locations. Guadalupe River State Park: The first on the list is the park made famous by its Guadalupe River, home to endless forms of watery fun and the reason thousands of visitors come to the state every year. There isn’t a whole lot of exotic nature there, but the place is nonetheless breathtaking and a must-see whenever the river isn’t being flooded. It’s also only around 18 miles from Boerne, making it a manageable summertime trip for most Texans. Enchanted Rock State Natural Area: This state park gets its name from the pink rocky formations in the area that have a bit of a magical look to them. The rest of the place looks the part as well – Enchanted Rock seamlessly combines a mountainous and prairie-like area with abundant green nature, creating a unique location that has a little something for everyone. When you’re not rock-climbing or hiking in the company of a seasoned ranger, you can simply sit back after dusk and enjoy the beautiful starry sky from any of the park’s campsites. Being some 50 miles away from Boerne doesn’t exactly make it an attraction next door, but the trip will be well-worth it and will make any vacation memorable. Blanco State Park: One could say Blanco State Park has more water than most state parks, but isn’t that a good thing considering how hot the summer can get? From many angles, Blanco looks like a weird mixture between nature and man-made swimming pools, although it’s a very appealing one. Aside from the clear water being dispensed by unique formations of mini-waterfalls, Blanco State Park is home to a few interesting forms of wildlife, including ducks that can be fed by the visitors. Like the Guadalupe River State Park, Blanco is sometimes subjected to flooding so you’ll have to time your visit right, although that shouldn’t be hard since the park is a 28-mile ride from Boerne. Lyndon B. Johnson State Park: A bit harder to pronounce but no less worthy of a visit, the Lyndon B. Johnson State Park doesn’t host some of the more extreme activities from other parks but instead pays tribute to one of the nation’s great presidents. This park has a clear out-of-time feel to it while being perfectly combined with modern features that make a trip through history pleasant for everyone. Not to mention, it’s only 30 miles from Boerne by car, making it easy to reach whenever you’d like to take a historical breather. Florida’s beaches are among the most beautiful in all of the U.S. and surely fare well when compared to those from around the world. They’re fairly friendly and inviting, usually devoid of aggressive individuals (human, land or marine animals alike), plus you won’t have to deal with nagging insects that can ruin an entophobe’s beach camping trip. That being said, there are still things you should keep in mind to get the most out of your camping experience. Camping on the beach isn’t as difficult as other forms of outdoors camping but can still turn unpleasant if the right factors combine. Here are some tips to avoid this. Remember that Florida’s beaches are full of people. A lot of beach campers picked their spot thinking most of the swimmers and sunbathers would be gone by late afternoon only to find out that many of them are happy campers as well. If you don’t want to camp in the vicinity of other people, make sure to find a spot on the beach that’s secluded and doesn’t have a lot of people even during peak hours. Keep the safety of your belongings in mind. Adding to the first tip, personal objects have a knack for disappearing during lengthy excursions to the beach, especially if it’s a crowded one and you’re spending the night there. True, Florida is a safe place and doesn’t see nearly as much crime as some other areas, but that doesn’t mean it’s free of scavengers looking for a quick buck. If you’d like to guarantee the safety of your belongings, make sure to put them all inside your tent and use one that only opens from the inside. Stay ready for emergencies: Florida isn’t exactly a wild and menacing jungle despite the odd alligator taking a stroll through urban areas, but it pays to be prepared. No matter how safe your beach looks and how mature you and your camping buddies are, always keep a first-aid kit and a working phone on-hand. There’s no telling what could go wrong, and if something does, you’ll want to be ready for it. Watch out for noon: Whereas you might have otherwise timed your beach visits for early morning or afternoon, camping for a few days will expose you to the sun during its peak levels. Depending on how well your skin handles the sun’s rays, you might want to pick a spot with shade to hide in during these times as well as carry copious amounts of sun lotion – nothing ruins camping on the beach like some nasty sunburns. If you enjoy camping with the whole family, purchasing a quality family tent without going overboard in terms of how much you pay can get tricky. It’s even trickier since you can’t allow yourself to choose a subpar tent due to the presence of kids – you might feel like toughening it out is a good option, but they won’t. Here are 4 good tents for family camping – any one of them should serve you and your family well in most average camping situations. Wyoming Trail 4: Simple from the inside and complex from the outside is the story of this tent. Unlike most tents, it separates you and your spouse from your children by having two ‘compartments’, one smaller and one larger. The tent makes a few basic assumptions: that you and your spouse are on good terms, that your children don’t mind sleeping without their parents and that they’re not too old or giant-sized. If all of these conditions are met, however, Wyoming Trail 4 will be a great and cozy option that lets you camp next to your kids while giving them some privacy (and some to yourselves, as well). Price: $500. Saitaris 4: Made by Helleberg, a company that specializes in quality camping equipment, the Saitaris is a real deluxe tent with a price to go along with its status. The tent has two compartments for your gear – the smaller is meant to shelter your gear, letting you make the most use of the spacey main lodge. The manufacturer made this tent with extreme conditions in mind and it shouldn’t cave in and underperform no matter the weather you’re dealing with. If you don’t mind everyone in a group of up to 4 people sleeping next to each other, this tent might be the perfect choice. Price: $1,600. Kingdom 8: This tent might not make your camping trip feel like a visit to a kingdom, but it’s still plenty comfortable and boasts some amazing insulation. The tent’s dimensions mean that even adults are free to stand up without causing it to collapse, and there’s also plenty of sleeping room to go around. The tent comes with an optional ‘garage’ meant for storage and has a transparent lounge-type area where you can stargaze even in some harsh weather. Price: $450. Frontier 6: The biggest product on this list, this massive canvas tent can house up to 5 or even 6 people without any loss of comfort while also letting them stand up regardless of their height. Unlike many other models, this tent has a few large ‘windows’ that let you watch the action outside while remaining sheltered – of course, they can be covered to block light anytime. If you aren’t limited by how much cargo you can carry(or the price tag), this tent is a great option for larger families or those with adult children. Price: $1,400.